As the global trends towards health and fitness have picked up steam over the past five years, it’s hard to suppress the urge to become more active in our day-to-day lives. One of the easiest ways to get this injection of activity is to shake up our commuting routine, after all, there must be more productive ways to use our time than reading the same free paper on the subway, or staring at our phones on the bus trying to fight the motion sickness. The explosion in the number of bike sharing schemes around the world over the past decades has provided a reliable alternative to these sedentary modes of transport. Many of these schemes allow tremendous flexibility in their use as bikes can be picked up and dropped off at any location you choose, including outside your place of work for ultimate convenience. At ExpatFinder we decided to explore this new and exciting mode of transport which is now available on every continent (except Antarctica, although we don’t think they mind), in 66 countries and 56 capital cities around the world. Keep reading below as we take you around the globe to look at the ways in which these schemes are establishing themselves, and how they are changing the cities where they are. Scroll to the bottom of this article to view the full infographic, or click here. The first bike sharing schemes were started in 1965 in the Netherlands, although it took off in the mid-noughties when the system was blended with information technology to give rise to the system commonly used today. The data we have gathered now shows that this pervasive method of travel is now accessible in over 700 places around the globe. 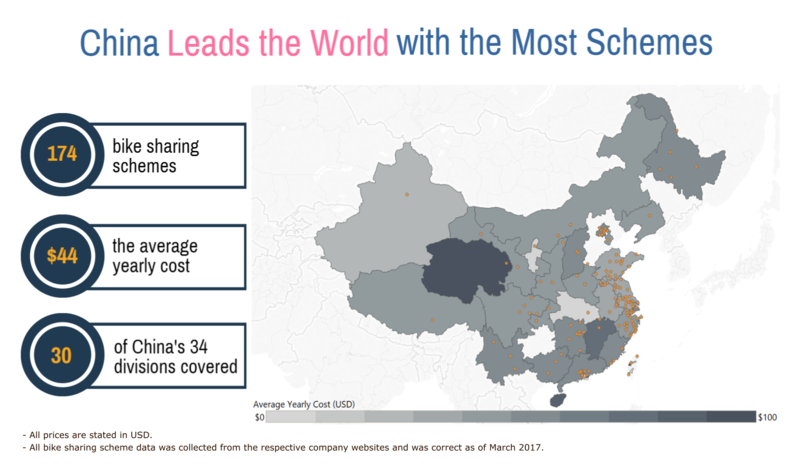 Digging through the data demonstrated a clear global leader in the number of bike sharing schemes, with China having a total of 174 systems for its 1.35 billion inhabitants. While the world average for a year’s regular usage is US$85, the highest potential cost we found was in Kyoto, where the same use would cost you a mammoth US$3,589. In stark contrast to these expensive schemes, 37 projects spread across the globe are free. Some of these have limitations, but the convenience for those who do have access is undeniable. Are Cheap Schemes a Slow Puncture for Bike Sharing? It’s all well and good for companies to offer free usage to their members for minutes or hours at a time, but can the membership fee actually cover the multitude of operating costs for the system owners? Many are already subsidised by local governments and councils, who are trying to push citizens towards the greener and healthier commuting alternatives. With 50% of the schemes we evaluated offering free rides of at least one hour, how long can these businesses keep going at the same rate? Not only must the bikes be maintained for roadworthiness and safety, but many schemes which offer a hop-on-hop-off mode of operation where users can pick up and leave the bikes at any location also have to hire teams of workers to go around cities and collect bikes for other users to be able to use them again. Other, more selfish users have been known to ‘park’ their hired bike within a condominium or on private property, making them inaccessible and causing other users to wander around trying to find a bike that isn’t accessible. A Vicious Cycle in China? China has undoubtedly solidified her position as the Queen of worldwide bike sharing, driven by new aspirations to be seen as a larger, and greener, modern economy compared than the past. Although currently the world’s leading emitter of carbon dioxide, China has been a major player in climate change talks around the world and is the world’s biggest investor in renewable energy technology. The country’s current 174 bike sharing projects currently service 30 out of 34 divisions but are mainly located in the largest population centres such as Guangzhou and Beijing. With the average yearly cost in China coming in at US$43.56, these schemes are for the most part aimed at getting as many users as possible. Stories of mass bike dumping have become well-known in China since they started appearing all over Shanghai and Shenzhen, with both unsympathetic users and pranksters leaving bikes in large piles all over the cities. To tackle this, the biggest service providers, have taken to hiring large numbers of workers to travel around the cities collecting as many bicycles as possible. As the Chinese government is backing the existence of these schemes so heavily, and with such a large budget, they will probably not be disappearing anytime soon. After all, in a country that needs transportation solutions for over 1.3 billion people and is trying to reduce its already massive greenhouse gas emissions, cars are never going to be the long-term answer. The most obvious use for these schemes is that they offer a great solution for that last part of for commute to work every day. As cities expand more and more and become megacities, workers are forced to move away from the centre and towards the outskirts. For those that live in the suburbs, these inexpensive bike sharing services provide a healthier and cheaper alternative to the more overcrowded public transport systems. In some cities, the uptake for bike sharing schemes has not been as significant as in others. In the Netherlands, many of the schemes are poorly utilised, as the country has a long-standing culture and tradition of cycling. In places such as this, bikes are already very cheap and affordable, so low-cost hire makes no real difference. Many see cycling as a more dangerous prospect than taking public transport, especially at rush hour in major cities, where roads are congested and other, larger, vehicles are innumerate. In some ways, this is a valid concern, but many forget the health benefits that are brought about by the regular exercise that cycling can bring. In a 2010 study, a team of researchers totalled up all of the benefits and disadvantages of regular cycling in a busy city and found that it has a net increase in your lifespan. The scientists found that the risk of an accident would remove around seven days from an average person’s life, and 21 days due to the increased risk of air pollution. These two figures, however, pale in comparison to the 240 days gained on the average person’s life from the increased physical activity. Although there is a risk of an accident occurring when cycling in busy traffic, multiple studies have found that users of bike-sharing schemes are less likely to be involved in accidents. Several explanations have been offered for this, including that users of these bikes are often more cautious than regular cyclists. Regardless of how low the pricing many be from some companies, the rate at which bike sharing is adopted may vary widely due to factors that are out of a business’ control, such as the weather conditions and a city’s layout. Only intelligent and individual analysis of a host city can prepare bike sharing schemes for these types of barriers to success. Not only governments are picking up on the potential benefits for the environment and their citizens, with companies now beginning their own schemes to help their employees get to work in a more flexible and healthy fashion. After all, global talents will always be attracted to modern and forward thinking locations and businesses, and bike sharing is a prime example of this mindset. Cities wishing to entice the best talent from around the world will need to fully integrate bike sharing as a day-to-day reality of city life. 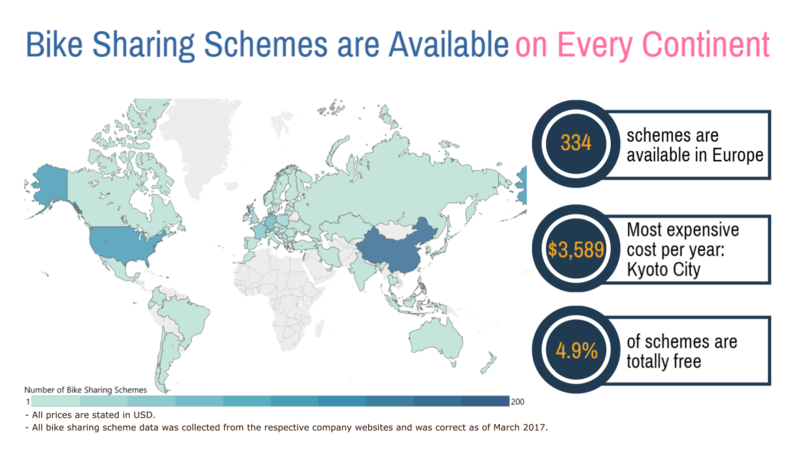 Data on bike sharing scheme costs around the world was collected from the relevant company websites in March 2017. The exchange rates used to convert local currencies to USD were accurate as of 3rd April 2017. A year’s usage was calculated as taking a bike to and from work for 200 days of the year; or 400, 30-minute trips for a total of 200 hours over the course of a year. This also includes any membership fees or initial deposit required. All calculations of average used the median value. Information on lifetime gained from cycling to work was taken from Johan de Hartog D, Boogaard H, Nijland H, Hoek G. (2010) Do the Health Benefits of Cycling Outweigh the Risks? Environ Health Perspect. 118(8): 1109-1116.